I’ll be appearing at London’s newest literary festival. 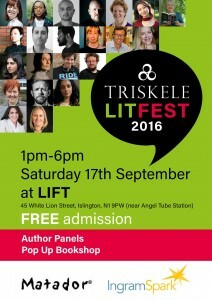 The Triskele Lit Fest will be in Islington on Saturday, 17th of September. It’s a full line up of award-winning authors across the genres…and it’s free. I’ll be speaking at 1 pm on the sci-fi panel, and hope to see you there!